Bringing artful intrigue to inspiration, this vibrant piece celebrates the power of perseverance. Bringing artful intrigue to inspiration, this vibrant piece by Alena Hennessy celebrates the power of perseverance. 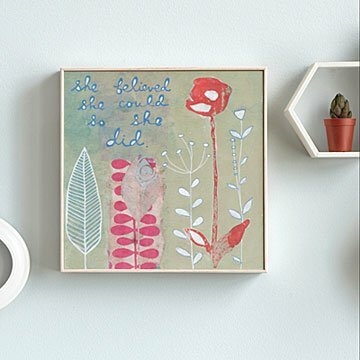 Whether you're gifting for a new graduate or celebrating your own new beginnings, this eye-catching artwork offers encouragement with an empowering quote nestled between bold blossoms and a colorful palette. Display this compelling piece unframed on high quality Hahnemuhle Torchon acid-free watercolor paper, or mounted on a wood block and framed in an ash moulding. Made in Portland, Oregon. Great for a bathroom or hallway or even to lean up against a wall on a counter or in bookshelves. So many uses and pretty colors. I love this. It hangs just before I leave my home as an inspiration. Shipping was on time, as well. We purchased this as a gift to mark our niece's accomplishment on her master's degree and promotion to head coach for a women's college softball team. We know how hard she worked to achieve this and she was so touched when she received it. She hung it on her wall and snapped a pict before calling to thank us! The product is a gift for a friend who has just graduated with a Masters in Engineering. She will be using it as a decorative piece in her living room, which she has just re-done and decorated. I gave this to my daughter-in-law who graduated with her masters. As a working mother of two young boys, she really did have to believe she could do it! What a lot of work it took to achieve her goal. A gift for a young lady. We both loved it. Bought it for a gift and she really liked it a lot. This is nicely finished and looks just like the picture (only better). Before sending this to my grand daughter I will write a short personal extension of the message on the back. I think I will write it on paper and fold it over the hanging wire which is all ready in place.